Serving as the new Mother's day weekend tradition, 43 NASCAR Sprint Cup cars took the green flag to the Showtime Southern 500 at Darlington Raceway. With the mothers in NASCAR providing a commanding chorus for starting engines, competitors took the green flag with the #1 McDonalds Chevrolet of Jamie McMurray leading the field to the start line. Once the race was underway, McMurray's fellow front row starter Jeff Gordon took his #24 Chevrolet to the lead by lap 1. Gordon would lead the first 37 circuits around the 1.366 mile oval until Brian Vickers drove by in his #83 Red Bull Toyota to take the top spot. With the lead returning to Jamie McMurray after a pit road hustle under a lap 47 caution, he masterfully launched on the restart as than 2nd place Jeff Gordon couldn't anticipate the acceleration of the #1 Chevrolet. Gordon fell to fourth complaining that the #1 car illegally jumped the race back to green. However, observations other than Jeff Gordon's point of view saw McMurray's restart as a clean acceleration to the start/finish line. Gordon fell to fourth place as his #24 Hendrick Motorsports-owned Chevrolet remained in contention throughout the event. In past years at Darlington Raceway, the asphalt surface was renowned as an abrasive to tires. This resulted in every pit stop concluding with a no-brainer call for four tires as even tires a few laps old would be drastically slower than new rubber. However, since Darlington was resurfaced in 2008, strategy has been complicated when the less weathered asphalt did not strip tires to the same severity. Using this change in strategy on a yellow flag pit stop at lap 85, Tony Stewart was able to take the lead holding it for five laps under the caution when the #14 car was unable to enter the team's pit box. While Jeff Gordon would overhaul the #14 Chevrolet on the restart, Stewart was able to settle into 6th place until he needed to pit for fuel on lap 120. Also pitting off-sequence with the field was the #88 AMP Energy Chevrolet of Dale Earnhardt Jr. For the second week in a row, a tire problem brought this Hendrick Motorsports Chevrolet into pit road prematurely. Pitting for a flat on lap 131, the Showtime Southern 500 race was at least more favourable to the #88 car. While Earnhardt Jr could not make a lasting impact in the top-10 at Darlington during the Saturday night event, an 18th place result did allow him to reclaim 12th place in the NASCAR Sprint Cup points following the race. With 20 lead changes amongst 11 leaders, the dominant cars in the Showtime Southern 500 were the #11 Toyota of Denny Hamlin and the #24 Chevrolet of Jeff Gordon. With both drivers leading over 100 laps apiece, their cars were mainstays at the front of this event all night. Less than a month after leg surgery, Denny Hamlin is concluding his sudden Sprint Cup series resurgence taking the lead at Darlington for lap 141. Only holding the position for 5 laps on that occasion in the #11 FexEx Toyota, Hamlin first showed his potentially winning hand in the Sprint Cup race. 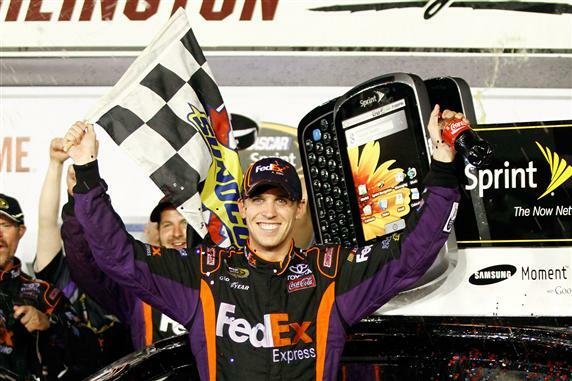 Denny Hamlin had won the NASCAR Nationwide Series event at Darlington the night before. While Jeff Gordon was enjoying another chance to end his 39 race winless streak, 4-time defending Sprint Cup champion Jimmie Johnson was dealing with what ultimate turned into his roughest race of the 2010 season. In the infant stages of the Showtime Southern 500, the #48 Lowes Chevrolet began to progress from the 22nd place start moving up to 17th after the first 5 laps. However, Johnson's efforts to advance in the race was hampered early as the #48 car brushed the wall becoming an early recipient of the Darlington stripe. 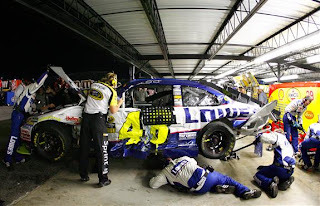 With minor sheet metal damage, the Hendrick Motorsports #48 pit crew were able to patch this problem with several pit road trips sending Johnson back into competition. Despite enduring the early complications, Johnson would be involved in two additional accidents. First tangling with the #56 NAPA Toyota of Martin Truex Jr on lap 82, the figurative nail in the coffin resulted less than a 100 laps later. On lap 180, the 6th caution of the event flew initially for a spinning #37 car belonging to Kevin Conway but a bizarre crash results seconds later in turn 4 when the #43 Ford of AJ Allmendinger slid sideways on the track apron colliding hard into Jimmie Johnson's already wounded vehicle. McMurray, Hamlin, Gordon and later the #31 CAT Chevrolet of Jeff Burton and the #18 of Kyle Busch would lead the second half of the Showtime Southern 500 at Darlington Raceway. It was an impressive effort by the entire #18 Joe Gibbs Racing team that saw Kyle Busch hold the lead for a total 29 laps in a back-up race car that started 43rd. Another hard charger at Darlington was the #29 Richard Childress Racing Chevrolet driven by points leader Kevin Harvick will lept form 35th spot to the top-10. With closest Sprint Cup points challenger Jimmie Johnson encountering troubles in the 500 mile event, Harvick had a major opportunity for a major points payday (a feat that came true with Harvick leaving with a 6th place finish in the race and a 110 point lead over Johnson heading into Dover). 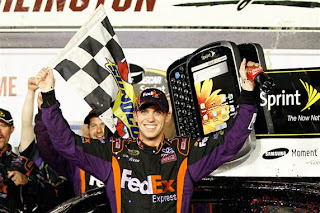 With a 11th and final caution flying at lap 343 for the #20 Toyota of Joey Logano spinning leaving pit road, Denny Hamlin took the lead one lap later on a pit stop cycle and would sail the #11 FedEx Toyota to a third victory for 2010 for Joe Gibbs Racing. Along with celebrating in Darlington's victory lane, Hamlin has elevated himself to 6th in the NASCAR Sprint Cup points standings after an unfortunate start to the season. 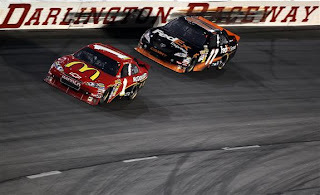 Earning an honourable 2nd place finish, pole sitter Jamie McMurray built some serious non-restrictor place racing momentum which included 71 laps out front in the Showtime Southern 500. Unlike McMurray who was in clear view at the front of the field for much of the event, the #2 Miller Lite Dodge of Kurt Busch quietly work his way to a 3rd place run. The elder Busch driving for Penske Racing also scored a significant gain in catching Jimmie Johnson in points. After Darlington, Kurt Busch is only 3 points behind Johnson for 2nd place. After another strong outing, Jeff Gordon and the #24 Hendrick Motorsport squad settles for a 4th place finish. Not the victory the driver would want, the finish nonetheless is securing Gordon's chances in the 2010 Sprint Cup chase. Rolling out the top-5 five at the NASCAR Sprint Cup race at Darlington is the #42 Chevrolet of Juan Montoya. The next race for the NASCAR Sprint Cup series taking place on the 1-mile Dover International Speedway Sunday May 16th.